Dr. Kekuni Blaisdell (2012), is professor emeritus of Medicine at the University of Hawaii at Manoa’s (UHM) John A Burns School of Medicine, consultant in the Department of Native Hawaiian Health (UH), and co-founder of E Ola Mau, an organization of Hawaiian health professionals. 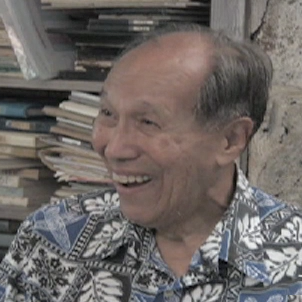 Joining the Hawaiian sovereignty movement in the 1980s, Blaisdell became one of the founders of Ka Pakaukau (a pro-independence organization) and was the convenor of the Ka Ho’okolokolonui Kanaka Maoli: 1993 The Peoples’ International Tribunal Hawaii (often referred to as the Kanaka Maoli Tribunal). In part 1, Dr. Blaisdell reflects on his life, his research on the health conditions of Kanaka Maoli (Native Hawaiian), and his advocacy for an independent Hawaiian nation. Running Time: approx. 28 min. In Part 2, Dr. Kekuni Blaisdell discusses the events that led up to the Ka Ho’okolokolonui Kanaka Maoli: 1993 The Peoples’ International Tribunal Hawai’i (often referred to as the Kanaka Maoli Tribunal) and reflects upon the political movement to restore the Hawaiian nation.